In this new monograph, adapted from Annex 1 of his superb recent book, Catastrophic Failure: Blindfolding America in the Face of Jihad, Senior Fellow at the Center for Security Policy Stephen Coughlin explains what’s really behind the so-called ‘interfaith dialogue movement’ and how the Muslim Brotherhood has co-opted the well-meaning but misguided intentions of the Catholic Church in particular. Mr. Coughlin’s expertise in the nexus between Islamic Law (shariah) and Islamic terrorism informs his exposure of the manipulative Brotherhood strategy to use the interfaith dialogue arena as an opportunity to edge Catholics toward a dislocation of faith so as to pave the way for the insinuation of shariah into American faith communities and society in general. At a time when Vatican policy seems to many to have become unmoored from the traditional doctrinal teachings of the Church in ways advanced by the permissive environment of the interfaith dialogue movement, including tolerance of anti-Constitutional, anti-Western, shariah-based Islamic principles as well as those who promote them, this publication hits home hard. As Mr. Coughlin points out, it is intellectually impossible to adhere faithfully to Church doctrine and yet grant acceptance to principles that are fundamentally opposed to such precepts at the same time. Only a dislocation of Catholic faith could allow such moral equivalence. Ultimately, as he argues, the objective of Islamic supremacists is the prioritization of interfaith relationships over advocacy on behalf of fellow Christians being slaughtered elsewhere by the co-religionists of their Muslim interfaith partners—in other words, the neutralization of the Catholic faith community as a serious obstacle to the encroachment of shariah. The Center for Security Policy/Secure Freedom is proud to present this monograph as a superb addition to its Civilization Jihad Reader Series. 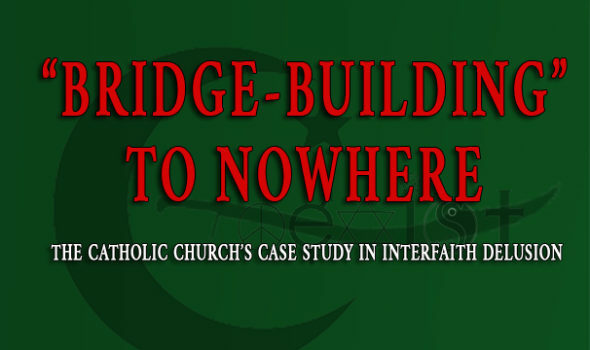 “Bridge-Building” to Nowhere: The Catholic Church’s Case Study in Interfaith Delusion is available for purchase in kindle and paperback format on Amazon.com.